Mushrooms are a wonderful, perhaps slightly undervalued ingredient. The truth is they’re a great cooking companion naturally high in the pleasing savoury ‘umami’ flavour. If you’ve yet to fall in favour of the wonder of mushrooms try your hand at making these stuffed mushrooms – they are absolute flavour bombs. 2. Carefully remove the stems of the mushrooms to allow more room for stuffing. 3. Place the mushrooms in a baking dish or tray and roast for 12–15 minutes. 4. Remove any excess liquid from the cavities in the mushrooms and the dish. 5. Roughly chop the stems and add them to a small frying pan with the butter and black garlic. 6. Sauté the mushroom bits until they are browned and fragrant (make sure all the moisture has cooked out). 7. To make the stuffing, combine the sautéed mushroom mixture, cream cheese, chives, lemon zest, parmesan and truffle oil in a small mixing bowl. 8. Season to taste and then spoon the mixture into the pre-roasted mushroom cups. 9. 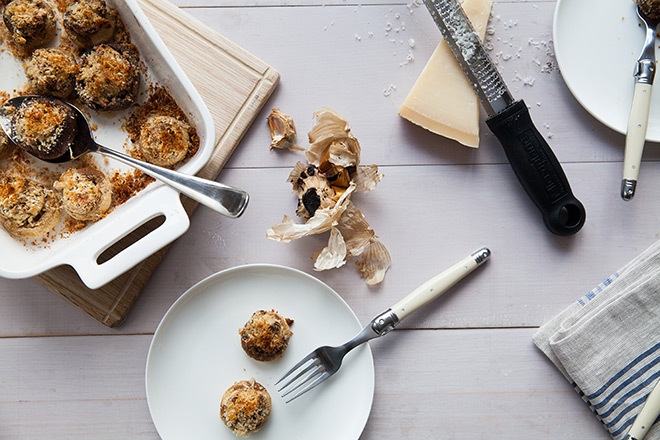 Combine the parmesan and breadcrumbs and sprinkle onto each mushroom. 10. Drizzle lightly with truffle infused olive oil. 11. Roast for about 15 minutes or until the crumb mixture is crispy and golden brown. 12. Serve garnished with micro rocket leaves. 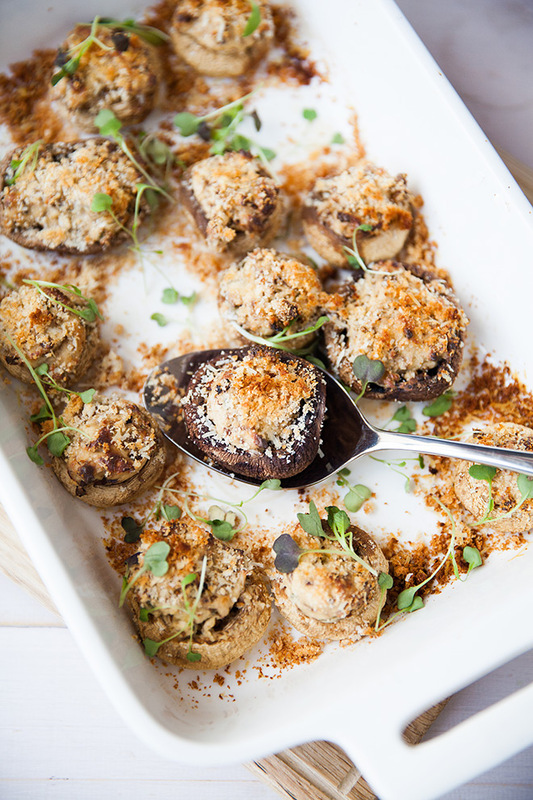 This dish puts the “mmmm” in mushroom and makes for a tasty and slightly different party snack. I can already see you patting yourself on the back for this one.